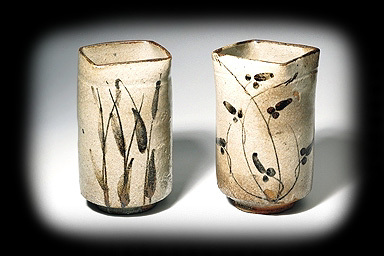 The two mukozuke containers were used to serve the kaiseki meal, part of the formal tea ceremony. The form, decoration, and function of these dishes are quintessentially "Japanese." However, their aesthetic sensibility and method of production combine influences that were originally Korean. When Japan invaded Korea in the 1590s, Korean potters were brought back to Karatsu where they introduced a multichambered climbing kiln and the kick-wheel. The unaffected rusticity of the Korean wares were highly appreciated by Japanese tea masters and became an important component of Japan's ritualized tea ceremony. Japan's relationship to the world has been characterized by cycles of insularity alternating with intense and even aggressive interaction. Its adaptation of foreign cultures sometimes occurred through peaceful association and, more rarely, through military and forcible appropriation. For example, this female clay sculpture from Horyuji temple illustrates the absorption of Chinese prototypes in eighth-century Japanese art. Conversely, the important stoneware traditions of Kyushu during the Momoyama and early Edo periods, as seen in these Karatsu mukozuke dishes, owe much to Japan's imperialist aspirations: the earliest potters were Koreans captured and brought back to Japan following Japan's invasion of Korea in the 1590s.